I came up with this post - what else? 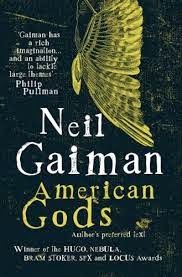 I just finished reading Neil Gaiman's American Gods again and have been (once again) blown away. Instead of writing a long post about how awesome it is, I decided to have some fun by writing it Buzzfeed style - click-bait title and lists and breathless writing and all (I'm not great at finding animated GIFs, so you'll have to do without those). Here are eight reasons you should drop everything and read Neil Gaiman's American Gods NOW. 1. For the concept alone. The book is based on what is certainly one of the best ideas in the world of SF / Fantasy in a long time. The idea is simple (and obvious when you think about it). All the migrants who ever came to America brought their Gods along with them - African Gods and Irish Gods, Indian Gods and Chinese Gods. They worshiped these Gods, fed them with their prayers and sacrifices. But today, these Old Gods are slowly becoming powerless, as Americans become less religious, and start worshiping new Gods - Technology, Money, Drugs, Media. And now there's a war brewing between the New Gods and the Old Gods. 2. For the characters. The lead character is Shadow, an ex-con whose sense of loyalty and justice makes you fall in love with him. But he's one of the few humans in the book. American Gods is like a Who's Who of Gods from across the world. There's Odin and Anansi, Anubis and Bast, Kali and Ganesh. And many more that I didn't even recognize. And there are other creatures too - there are jinns and leprechauns, dwarves and thunderbirds. 3. Because nobody can quite figure out what the book IS. In Gaiman's own words, "... it was given a number of awards including the Nebula and the Hugo awards (for, primarily, SF), the Bram Stoker award (for horror), the Locus award (for fantasy), demonstrating that it may have been a fairly odd novel and that even if it was popular nobody was quite certain which box it belonged in." Is it a travelogue, is it a thriller, is it a romance? Who knows, and - frankly - who cares? 4. Because it's on pretty much every 'Best Fantasy Books' list out there. Maybe you don't care much about such lists, but here's one. And another one. Oh, one more. And another one. These are just the first few from a Google search, by the way. But I guess you get the picture. 5. Because they're making a TV series out of it. I don't know about you, but I like to read the book before I watch an adaptation. But don't worry - they've just announced the series, so you have some time to read the book before the series comes out. I just hope it's better than Neverwhere, which was I thought was quite bad (here's a sample). Neverwhere is strange because the TV series came first and then the book, but the book is still better - which just proves that books are always better than their screen versions, no matter which one comes first. 6. Because of how obsessed people have become about it. In Gaiman's words again, "... you create something like American Gods, which attracts fans and obsessives and people who tattoo quotes from it on themselves or each other, and who all, tattooed or not, just care about it deeply ..." Here's the tattoo bit he was probably talking about. 7. Because it's so awesome you don't want it to end. And it almost doesn't. It doesn't matter whether you're looking for a quality read or a quantity read. American Gods scores on both counts. The copy I just finished reading (the author's preferred version) is 600-plus pages. And even with that, you really don't want it to end. You want it to keep going on for ever and ever, because you love Shadow, and you don't want to leave him. 8. Because it's Neil Gaiman. I put this reason last, but really - do you NEED any other reason? Gaiman is the brain behind Sandman, Neverwhere and The Ocean at the End of the Lane. He describes himself as a "messy-haired white male author trapped in the body of an identical white male author with perhaps even less-tidy hair". I also like his Twitter bio, "will eventually grow up and get a real job. Until then, will keep making things up and writing them down." American Gods is probably the best of Gaiman's novels. READ.